Pastor Ellen Meissgeier began her ministry at Resurrection Lutheran Church in September 1994 after having served as associate pastor at Christ Lutheran Church in Kulpsville, PA.
A 1988 graduate of the Lutheran Theological Seminary at Philadelphia, she was awarded the Master of Divinity degree and was ordained August 5th of that year. In addition to serving congregations, Pastor Meissgeier has served as a supervisor for seminary students and as an instructor at the seminary, working with first and second year students. 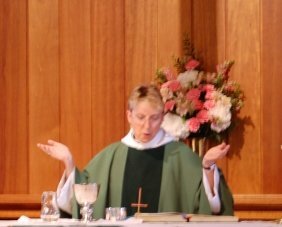 She has also served two terms as Dean of the Lower Montgomery Conference and for four years as the Director of Mobility for the Office of the Bishop, SEPA Synod. Prior to entering seminary, Pastor Meissgeier taught 7th and 8th grade at Our Savior Lutheran School which was co-sponsored by the Lutheran Church Missouri Synod and the Lutheran Church in America. At the time she was an active member of Zion Lutheran Church, Bristol, PA.